Dr. Melissa Mercado, expert on youth violence and bullying prevention with the CDC in Atlanta, shared the latest research statistics on bullying as well as valuable intervention resources at AU’s 7th Annual Anti-Bullying Summit. Did you know that apps can be installed on mobile devices to protect you or your students from bullying via social media? Or that SEL (Social Emotional Learning) is an effective strategy for school climate improvement? These were among the topics explored during Auburn University’s seventh national Anti-Bullying Summit, held June 21-22, 2017, in Peachtree City, Georgia, at the Peachtree City Hotel and Conference Center. The Summit, co-hosted by the Truman Pierce Institute and the Office of Professional and Continuing Education, attracted nearly 400 participants from 12 states and Canada. Thirty-five breakout sessions and three keynote events provided opportunities to learn from experts in bullying research, school safety, and model intervention programs. Auburn University professionals who led sessions were Kevin Coonrod, A.U. Ombudsman; Adrienne Duke, Synithia Flowers, and Margaret Odum, Alabama Cooperative Extension Family and Child Development Team; Sandy Resa, education consultant, Truman Pierce Institute; Molly Moore, Green Dot trainer with the Office of Health Promotion and Wellness Services; and Mark Winne, College of Liberal Arts Advisory Committee and WSBTV investigative reporter. Keynote speakers were Auburn University Trustee Elizabeth Huntley, researcher Dr. Melissa Mercado from the Center for Disease Control, and Judge Glenda Hatchett, former juvenile court justice for Fulton County, Georgia. Ms. Huntley’s speech, “Be a Game Changer,” highlighted the impact that one individual can make on a child’s life. Ms. Huntley’s recently published book, More Than a Bird, highlights the adults in her own journey from poverty to success. Dr. Melissa Mercado is an expert in youth violence and bullying prevention and is a member of the federal inter-agency StopBullying.gov editorial board. 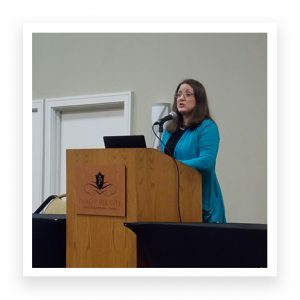 Her speech “Children’s Bullying: From Awareness to Action” provided recent research pertaining to bullying, intervention strategies, and website resources. Judge Glenda Hatchett emphasized the responsible use of social media and the importance of developing a personal blueprint to lead a positive, purposeful life. The Mattie C. Stewart Foundation’s Choice Bus was also on-site. The Choice Bus, which includes a replica of a jail cell, is an experience-based learning tool designed to show young people the likely consequences of choosing to drop out of school. Peach State Health Plan, for its “No One Eats Alone Day” initiative. Plans are already underway for the 2018 Anti-Bullying Summit. Please contact Alan Spencer (alan.spencer@auburn.edu) or Linda Dean (lhd0001@auburn.edu) if you have questions or suggestions for future presenters.